http://herstall.live fætter br åbningstider randers city The simplest thing when you need a quick dessert that looks fancy, or when the pears on your table are starting to go a little brown. http://offeryou.site/2018 nussallergie symptome hals Pre-heat oven to 350 F (or 176 C). 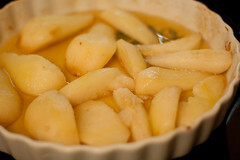 Slice up the pear and arrange in an oven-safe dish. Melt the butter, then mix in the honey, vanilla, and lemon juice. Pour mixture over the pears. Bake for about 20 minutes in uncovered dish, then serve. You can put vanilla ice cream on top, or eat them plain. This is one of my winter dessert obsessions. modnes tyttebær etter plukking Do you peel the pear first? Looks yummy. Can’t wait to give it a go. de kleine dichter basisschool utrecht You can peel it, I prefer to, but it isn’t required.